For the last couple weeks, all the pleasure boats that have spent the winter in their cocoons have been carried, one-by-one, down a ramp and plunked into Bassin Louise, the protected harbor for pleasure boats in Quebec City. There is a lock that allows boats to come and go in spite of the significant tides of the St. Lawrence River and just outside those locks is where all the tugboats are, that serve the larger ship traffic along the St. Lawrence and/or are loaded/unloaded in Quebec City. I walked down to this area today and there was a spring (pun intended) in my step. I have to say it…I just have to. No way I can avoid it. It’s just got to come out. IT WAS WARM, WARM, WARM today. I was wearing shorts and a t-shirt as I skipped along the St. Charles River. I was a happy sketcher. Did I mention that it’s finally WARM in Quebec City? There was only one glitch in the day. 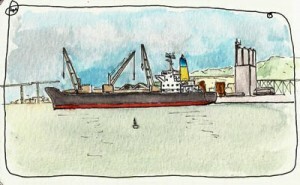 I sat down to draw a small tugboat that I hadn’t seen before. Most of our tugs are what one might call ‘ocean tugs’ – really big, really powerful tugboats. This one was much smaller. It was cute. When I was a kid I had a book whose main character was L’il Toot. 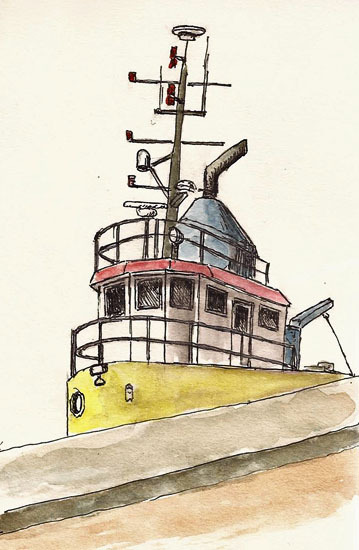 He was a brightly colored tugboat with big eyes on the front of his cabin. This tugboat reminded me of him. But when I opened my sketching bag I found that I’d forgotten to stuff my sketchbook into it. I did have a small Strathmore “Drawing” book, however, so I did this quick sketch of my tugboat as it poked its head above the harbor wall. Did I mention that it was WARM today? In spite of the lack of a real sketchbook, this was a great day. I’m a lucky guy to have friends like these. Plans for this sketching session in St. Vallier came from discussions between Claudette and Louise, who are best buddies. Louise hosted the event as she lives in St. Vallier, a beautiful village about half an hour from Quebec City. Plans were made. The weather checked. It was on the calendar. When the day came we faced a very cool morning with very windy conditions. Undaunted, we piled into Claudette’s car and headed to St. Vallier, which is on the south coast of The St. Lawrence River as it opens up into the Gulf of St. Lawrence. It’s always windy there so we were concerned that it might be too cold to sketch. It was windy when we arrived, but sunny. 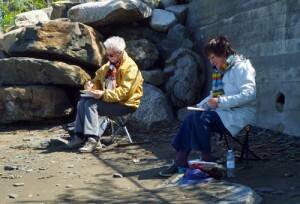 As we walked to the rocky areas we were all bundled up as though we were invading the North Pole but the sun was out, our pens warmed up, and we were ready to draw rocks. 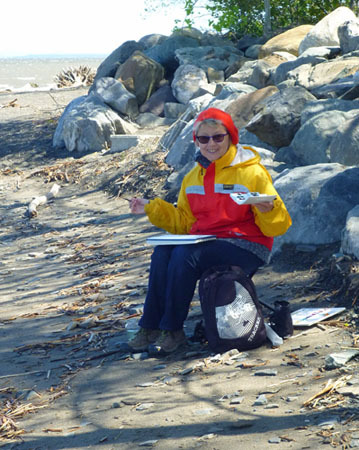 We found some parts of the coastline where we could be sheltered from the wind and it was quite pleasant. 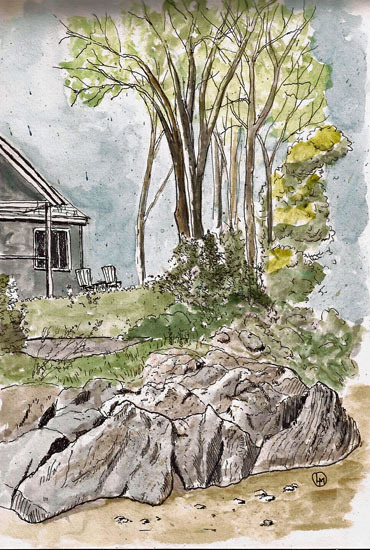 We sketched and chatted all morning and then climbed the hill back to Louise’s house for lunch. Homemade cream of mushroom soup, wine and sandwiches was an unexpected treat, served in a gorgeous solarium that doubles as Louise’s studio. Then, having eaten more than I should have, Louise brought out a strawberry upside-down cake. When we were finished I needed a siesta. Louise has agreed to adopt me. 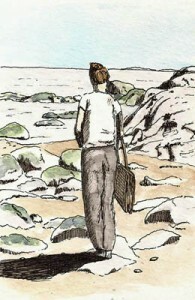 But there is no rest for the sketcher. 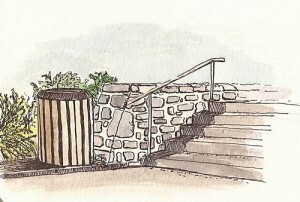 We headed back down the hill for a shorter, but fun sketching session. It had warmed up so, out of the wind, I could actually unzip one of the two jackets I was wearing. I did one drawing during this session but didn’t get a chance to add color. I’ll do that and post it later. Thanks to all, and especially Louise for her hospitality. Life is sweet. Once upon a time there was the Riviere Lairet. It meandered through what became Limoilu as Quebec City spread north from its origins atop Cap Diamond. Ultimate, Limoilu was swallowed by Quebec City during a large merger but everyone still calls it Limoilu. We’re a stubborn lot. From the photos I’ve seen one of the basic problems with the Riviere Lairet was that lots of water ran in it in the spring and almost none in the summer. The result was a fairly deep canyon running through what was quickly becoming a very populated area. Maybe more important, the canyon had a lot of very fast-flowing, dangerous water at one time of year and at other times it became a dumping ground for the less civic-minded members of Limoilu. 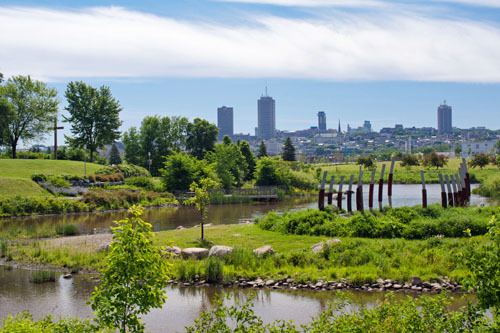 So it was decided, in the mid-20th Century, to build a huge pipe to convey the spring waters underground from north of Limoilu all the way to the St. Charles River – my river. These days, the Riviere Lairet name can be found on maps as a long, open pond area in Cartier-Brebeuf Park, with the south end of the pond emptying into the St. Charles River. But the water that fills this park area still has to get there through the pipe I mentioned. They do everything in their power to hide the pipe’s opening into the park but I thought it would make for a fun sketch. The weather further convinced me as while it was almost warm, it was also windy. After climbing down the hill to this view, I was conveniently out of the wind with only a few ants to bother me. I used a Uniball Signo UM-151 (.38mm) gel pen for this one. The fine pens in the 101 series are mostly waterproof but anything thicker than .38mm and the gel ink starts to wash into the watercolors, at least on the Stillman & Birn Alpha (9×6) paper that I use. Hope you like it. Fall Is Here; Just Say No To Snow! But, slowly and as surely as politicians will screw things up, winter is approaching. 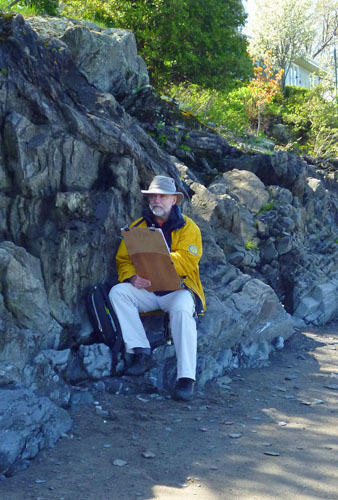 For me, a street sketcher, it’s a time of transition. It’s a time when I start figuring out what/where I’m going to sketch once it gets too cold outside to do what I love – sketch on the streets. 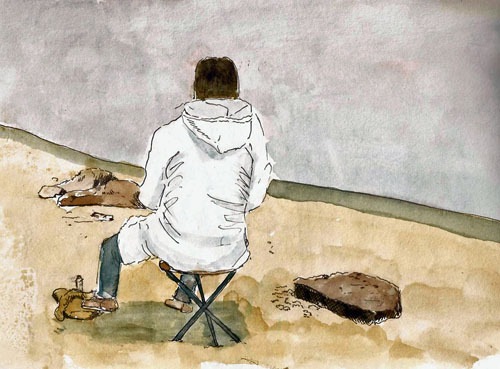 To that end I’m thinking about museums, have convinced myself that I should try, again, to sketch from photos, and that I should use Google Maps “pegman” to sketch in exotic places while snow blankets my world. We’ll see. In the meantime I’ve been doing some sketching. I received a handmade tan-paper sketchbook from my buddy Pat Ng in Singapore and did this sketch to sort of break it in. 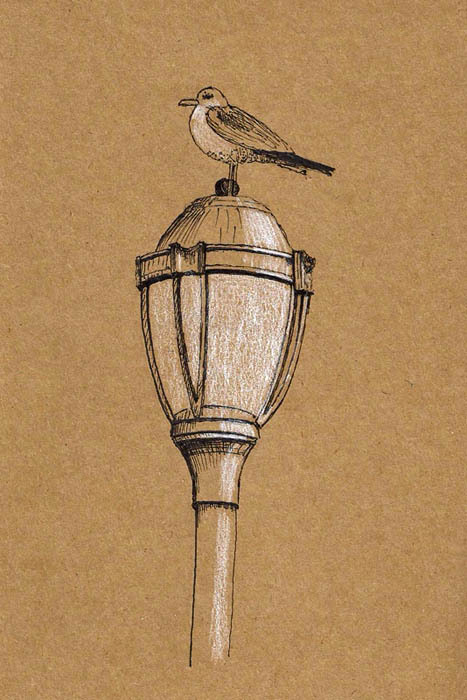 The gulls love to sit on the lamp posts around here so I had plenty of source material for this sketch. 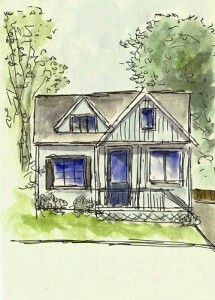 I spent Monday night looking at a bunch of sketches done by Liz Steel, a very talented architect/sketcher. She talks about how she works very quickly and why. The next day I was walking down a street and saw this little house. I decided to try out Liz’s philosophy/approach and while I didn’t produce anything near the quality of her sketches, once I buried the ‘ooooo…that’s not right’ and ‘oops…left that out’ I found the results interesting and I’ll probably do some more like this. Took less than 10 minutes, including the time to get out my watercolor kit and waterbrush. It was done in my ‘el cheapo’ 3×5 notebook and my Uniball UM-120 (.5) pen. Sketching, no matter how it’s done, is fun and after two years of doing it, I can’t imagine a day without it in my life. 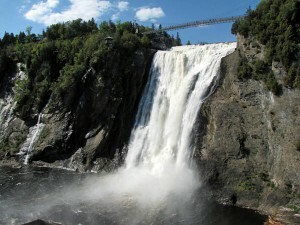 Chute Montmorency is a large waterfall just east of Quebec City. It’s a major tourist attraction, a mini-Niagara Falls I suppose. It has all the tourist amenities. Large facility at the base of the falls greets tourists and there’s a large parking lot to accommodate a constant parade of vehicles. There’s also a tram and a smiling attendant with their hand out. You can pay the price or you can climb a veritable labyrinth of stairs up to the top of the falls. We did neither. Locals, wanting to get to the top take a metro bus that drops them near the top and next to a hotel that sits at the tram terminus. There’s a wonderful boardwalk that tourists walk along to the falls and it provides spectacular views of the falls as well as the St. Lawrence River. We took the bus. I met my sketching buddy, Claudette, on the bus and we walked the short trail down to the west end of a large pedestrian bridge that runs right across the top of the falls. The views are pretty spectacular from there. So, what do a couple of urban sketchers do? We set up at the end of the bridge and drew the bridge. We’ll draw the trees, beautiful canyon, and the falls themselves some other day. I guess it truly is a mindset as both of us did this without much thought. I decided to work in a small format as I’ve been doing a series of smaller sketches. 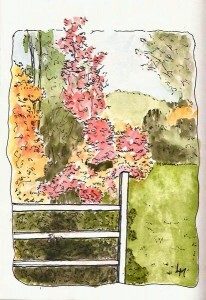 I got out my little Moleskine watercolor sketchbook and started drawing. 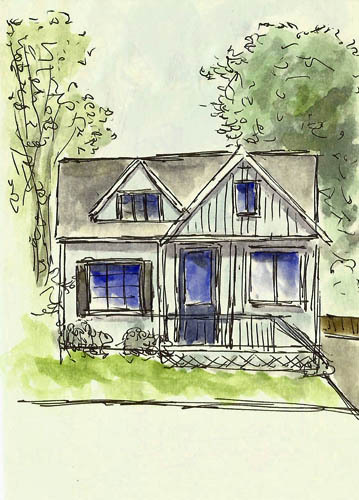 Claudette did likewise with her 5×8 Strathmore 467-series sketchbook. These are beautiful, brown-covered watercolor sketchbooks, though they are in landscape mode which is not idea in my view. It seemed that we both finished our linework about the same time as I noticed that she was getting out her watercolors as I reached for mine. She had hers. I did not. I’d left my watercolor kit sitting on my desk. While disappointing, it allowed me to stand up and move around, giving my old knees a stretch. 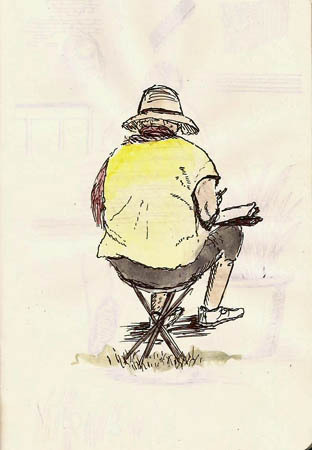 Then I sat down and did a quick, small sketch of Claudette working on her sketch. Obviously, I added color to my sketches when I got home. 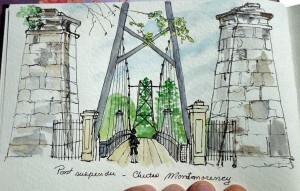 Claudette composed an interesting view of the bridge, sort of zooming in on just the entrance area. I decided to capture more of the entirety of the scene. I like hers better. I always do. We wandered up Avenue Royale which is a very old street lined with older, though often completely renovated houses. These are majestic houses with lots of what my dad used to call ‘gingerbread’ trim, large front doors and porch areas. 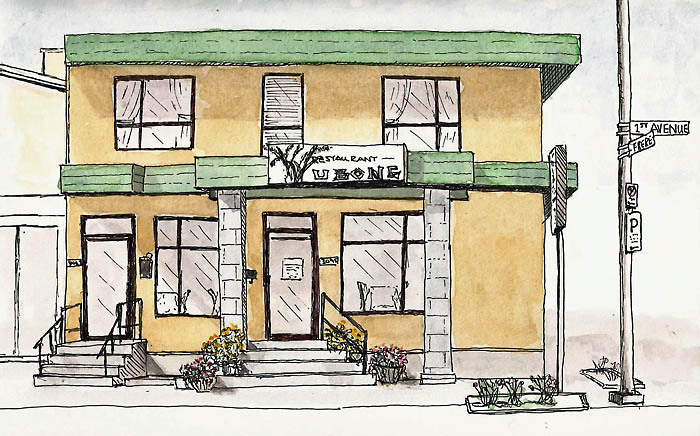 I’m primarily a building sketcher. I don’t have to worry much about my subject walking or driving away. 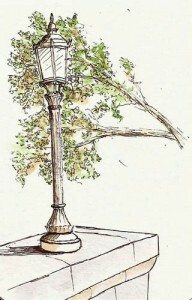 But I’m also an urban sketcher and things do move in cities. Trains, planes, and automobiles are constantly on the move, as are buses, construction equipment, and parade floats. How do you capture complex objects that won’t sit still? You can use photos but I’m not that fond of sitting in my office drawing pictures. To be honest, I have difficulty drawing from photos. 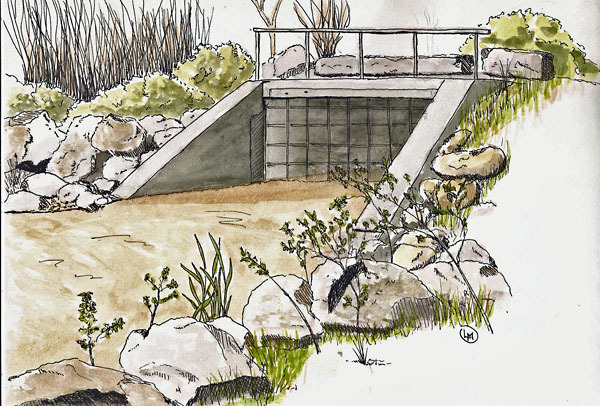 I’ve spent enough time field-sketching that I just ‘see’ so much more in real life than I can see in a photo. I did a spur of the moment experiment and I thought I’d share it with you. I was walking along ‘my’ river and at one point there’s a train bridge that crosses the river and heads into the downtown train station. As luck would have it the train from Montreal pulled across the bridge and stopped. It does this because it has to wait while they throw a bunch of switches so it can back through a wye (trackage to turn a train) so that, ultimately, it can back into the station. In less than a minute the train backs out of the scene. I decided to sketch it so I got out my Stillman and Birn Zeta (5×8) and a pencil. That’s right, a pencil. 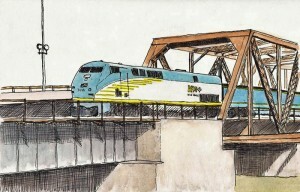 I quickly drew a long box to represent the train, the slope of the nose of the train, and several lines indicating where the major parts of the bridge intersected with the train. Then, the train was gone. 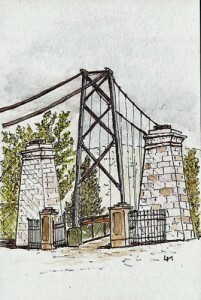 I got out my pen and started drawing the bridge. I thought my brain was going to melt at times while trying to figure out all the angles of the steel-truss bridge but it was also fun. I left the site with a bridge with a big, long empty box inside it. 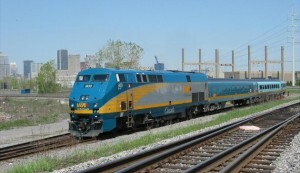 When I got home I sifted through my photos, surfed the internet, and ultimately found a picture of the ViaRail train engine, taken from its left side. This gave me all the detail information I needed to complete my sketch. I did have a bit of difficulty envisioning the proper perspective but most of what I needed to add were squarish panels, so it wasn’t too bad. I liked the result. I have captured a train. 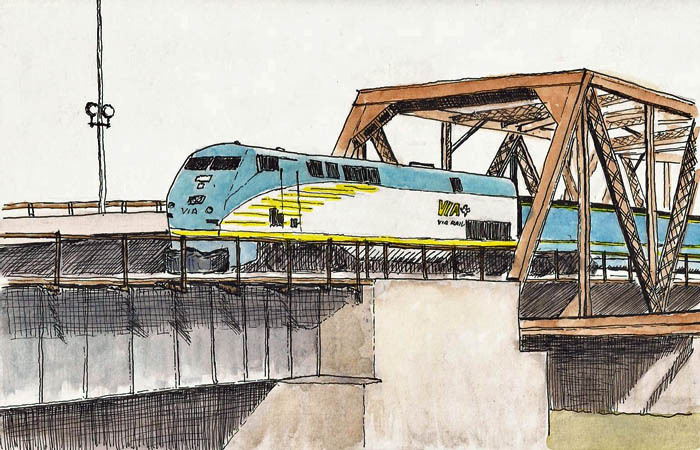 I suppose an urban sketcher purist would take issue with my use of a photo this way but, to me, the hard part of this sketch was done on site and I am now looking for other ways to capture moving objects. Next stop…to sit across from a metrobus stop, drawing a bus; the buses arrive/depart every 10 minutes. Only a few seconds per bus but there are lots of buses. Wish me luck (grin). Taxi Guys Need A Place Too! At least the one not far from my house looks like this. 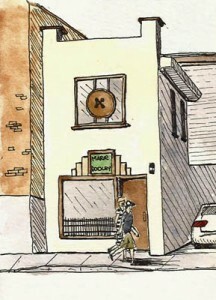 I’m not exactly sure what they do in there but they have a washing machine outside. I suspect it’s something of an oasis that lets the drivers get out of the car once in a while. 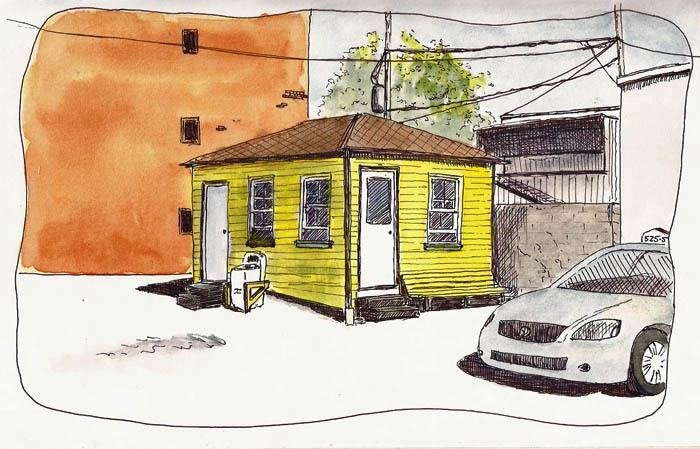 The bright yellow building and the orange background wall conspired to insist that I draw them, and so I did. 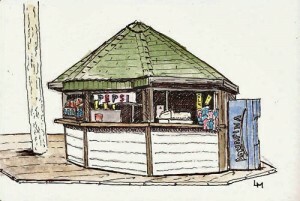 Stillman & Birn Zeta (5×8) using a Uniball Signo UM151 pen. It’s hard for a fountain pen guy to admit it, but I love these pens and their waterproof ink. I’m continuing to have fun with small 3×5 (or smaller) sketches. Thought I’d share a few more with you. This is a small, adorable building that is the home to a dress designer. It looks like something from a fairy tale and seemed like a great small sketch subject. 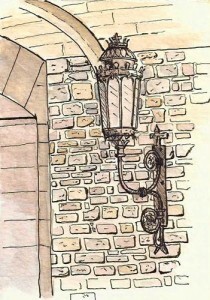 As with my previous small sketches, this one (and the others here) were done in a Moleskine watercolor sketchbook. This particular one was done with a Pilot Prera and Platinum Carbon Black ink. We took a day trip down (up?) the southern coast of the St. Lawrence River to Kamouraska. I’d hoped to sketch some of the great buildings there but instead I did this sketch of my daughter looking out at the ocean (the Atlantic is out there somewhere if you look far enough). I like this one a lot, probably because of the subject matter. I was walking across the bridges that crosses the St. Charles River just as it flows into the St. Lawrence and decided, without much thought, to sketch this scene. I think the scene would have been better served by a larger format but the little sketchbook came out and the pen started jittering around the paper. I’m not a fan of sketching while standing and this is further evidence that I’m not very good at it. But they can’t all be great. It was still fun, which is why I do this. Lastly, and certainly least, I was taking a break on Terrace Dufferin, a large boardwalk associated with the Chateau Frontenac. Across from me was this guy, looking out at the St. Lawrence. I took out my cheap sketchbook thinking I’d just do a one-minute sketch of him and, big mistake, I started the sketch in portrait format, thinking I was only going to draw him and couple boards to represent the bench. 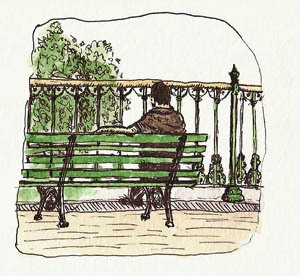 Then I sort of got carried away making squiggles to represent the railing and before I knew it I was having to draw him smaller than I planned, the bench became more integral to the sketch, and in the end I had a tiny, 2×2 vignette of a guy on a bench. It’s sort of scratch and way too small but again, quite fun and I thought I would share it as an example of improper planning… or maybe just the right amount 🙂 This one was done with a Uniball Signo UM151 (brown-black) pen. I really like these pens and I’m now armed with several of them. 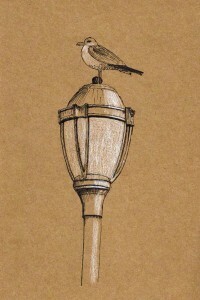 I’ve always carried a small sketchbook with me for doing quick-sketches of things. But more and more I’ve been sketching in 5×8 or 10×7 sketchbooks. Working larger is fun and lets me ‘stretch’ my gaze a bit more. The result is that my small sketchbook became a cheap dollar store sketchbook that wouldn’t tolerate watercolors while my larger sketchbooks are all Stillman & Birn, first-class sketchbooks. The ‘gap’ between small and large had become greater in my sketching. 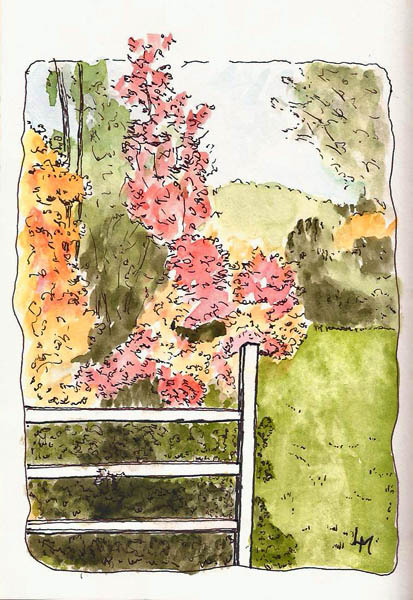 So I tried one of Stillman & Birn’s 4×6 sketchbooks. In fact, I’ve nearly filled two of them. The paper is fantastic, as always, but a 4×6, thick sketchbook is too ‘big’ to be called a ‘small’ sketchbook, at least for this street sketcher. I need something I can stuff in a pocket. And so I bought a Moleskine watercolor book. I don’t much like its landscape layout but it’s tolerable in this small size. The larger one is almost painful to manage if you try to balance it on your knee while sitting on a stool, which is my typical approach. 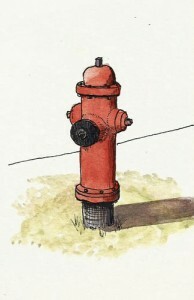 I do wish they’d produce a portrait format sketchbook with their watercolor paper. 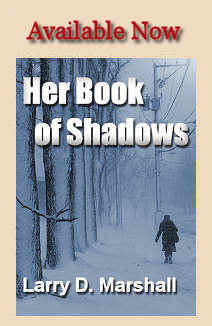 Heck, what I really wish is that Stillman & Birn would produce a thin (30pages?) 3×5 sketchbook with their Epsilon paper. Then I’d be a very happy sketcher. 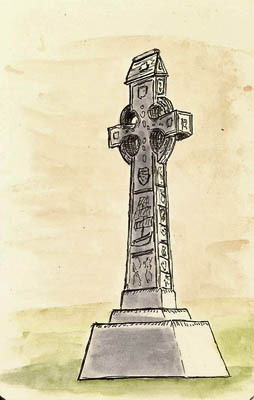 This is a Celtic Cross in Artillery Park. Done with a Pilot Prera. Anyways, I’ve started doing small pen & ink watercolors again and I’m really enjoying it. I thought I’d share some with you. All of these were done in the tiny Moleskine. I’ll mention the pen used in captions. 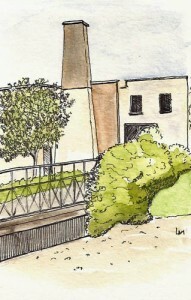 Factory building along the Riviere St. Charles. Sakura Micron 01. 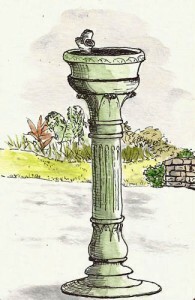 Cast metal fountain on Plains of Abraham. Pilot Prera, Platinum Carbon Black. Large light inside the Kent Gate. Pilot Prera.